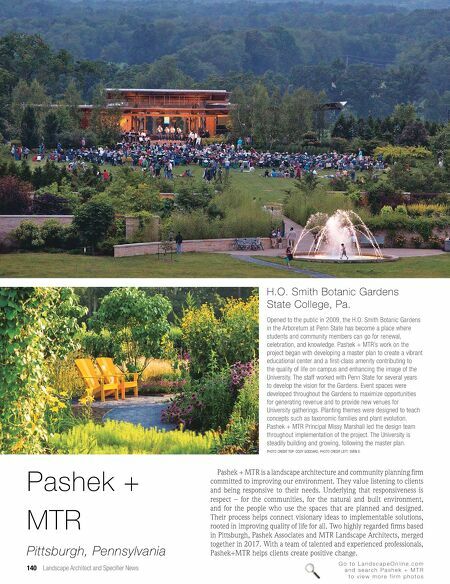 October 2018 141 Mario Lemieux Center for Blood Cancers Terrace Healing Garden, Pittsburgh, Pa. 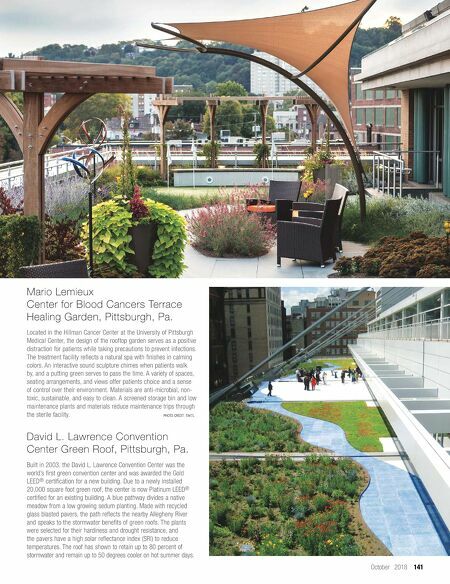 Located in the Hillman Cancer Center at the University of Pittsburgh Medical Center, the design of the rooftop garden serves as a positive distraction for patients while taking precautions to prevent infections. The treatment facility reflects a natural spa with finishes in calming colors. An interactive sound sculpture chimes when patients walk by, and a putting green serves to pass the time. A variety of spaces, seating arrangements, and views offer patients choice and a sense of control over their environment. Materials are anti-microbial, non- toxic, sustainable, and easy to clean. A screened storage bin and low maintenance plants and materials reduce maintenance trips through the sterile facility. PHOTO CREDIT: TAKTL David L. Lawrence Convention Center Green Roof, Pittsburgh, Pa. Built in 2003, the David L. Lawrence Convention Center was the world's first green convention center and was awarded the Gold LEED ® certification for a new building. Due to a newly installed 20,000 square foot green roof, the center is now Platinum LEED ® certified for an existing building. A blue pathway divides a native meadow from a low growing sedum planting. Made with recycled glass blasted pavers, the path reflects the nearby Allegheny River and speaks to the stormwater benefits of green roofs. The plants were selected for their hardiness and drought resistance, and the pavers have a high solar reflectance index (SRI) to reduce temperatures. The roof has shown to retain up to 80 percent of stormwater and remain up to 50 degrees cooler on hot summer days.